Smartphones are now as powerful and functional as some computers, so it’s important to give them the same level of protection. Follow these tips to reduce your exposure to mobile cybersecurity threats. If your phone ends up in the wrong hands, your first line of defense is to require a PIN or password to unlock the screen. Check the security settings on your phone to enable this feature. Just like your computer, your smartphone is susceptible to viruses and other malware. You need a security app with the same features as the security software on your computer. Look for one that can detect viruses in web sites, texts, e-mail, files and apps. Many apps allow you to locate your phone if it is lost or stolen. If you cannot find it, you may want to lock or wipe the data off of it to prevent someone from using it or looking through any personal information you may have stored on it. In many cases, you can find an anti-virus app that includes these features as well. You may be tempted to “jailbreak” or “root” your phone to access hidden features and unofficial apps. 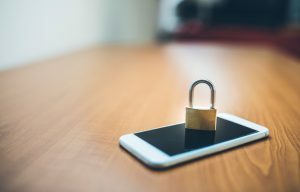 However, doing this can circumvent many of the safeguards that are built into the phone’s operating system, making it more vulnerable to unforeseen risks. You should backup all of the data stored on your phone – such as your contacts, documents, and photos. These files can be stored on your computer, on a removable storage card, or in the cloud. This will allow you to conveniently restore the information to your phone should it be lost, stolen, or otherwise erased. Before you install an app, research it and make sure it is legitimate. Many apps from untrusted sources contain malware that once installed can steal information, install viruses, and cause harm to your phone’s contents. Make sure to check the privacy settings for any app you install on your smartphone. You should be cautious to allow an app access to the personal information you have stored on your phone. Software, whether on your computer or on your phone, can have flaws that make it vulnerable to malware. As these flaws are discovered, the software developer will release updates to patch them, so it’s important to approve these updates when you see them become available. Unless you need to pair your phone to another device, turn this mode off. Leaving it on all the time will cause your phone to continuously advertise itself to other Bluetooth devices which could result in an unauthorized connection. Wipe data on your old phone before you donate, resell or recycle it. If you do not, you risk exposure of information that you may have forgotten was on your phone. If your phone is stolen, you should report the theft to your local law enforcement authorities and then register the stolen phone with your wireless provider. This will provide notice to all the major wireless service providers that the phone has been stolen and will allow for remote “bricking” of the phone so that it cannot be activated on any wireless network without your permission. Spam can be sent by text message just like by e-mail. Exercise the same caution you would if it was an e-mail. Be very cautious about any texts you receive that contain links. If you do not expect it, you should not open the link. Doing so could expose your phone to unwanted software or unexpected charges on your next bill.